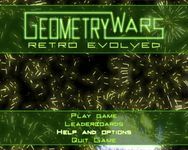 Geometry Wars: Retro Evolved is a old school style shooter, but remixed for the 21st century with next generation graphics and deep, modern gameplay. Playing is simple: you are a geometric "ship" trapped in a grid world, facing off against waves of deadly wanderers, snakes, and repulsars. Your aim is to survive long enough to set a high score! Avoid the spawning enemies, and shoot them down for points. You can also fire smart bombs, which destroy all bad guys on the screen. Save these up for when the going gets really tough! The more bad guys you kill, the higher your score multiplier goes (2x, 4x, etc.). The higher your multiplier, the more you can score. But don't die, as you lose your multiplier and have to build it up again from scratch!